Today, Michigan is home to many different animals and plants. Yet nearly 12,000 years ago it was home to very different kinds of animals and flora. Huge mastodons and mammoths roamed through southern Michigan. Whales, walruses, and giant rodents swam in the lakes, and shaggy musk oxen grazed in the woodlands. Now, 2000 years later, all but their fossils are gone. 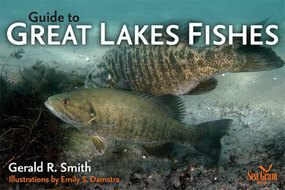 Ancient Life of the Great Lakes Basin provides a one-of-a- kind look at ancient life in the Great Lakes. Written for the layperson and for the professional with biological or geological interest in the Great Lakes region, the book describes most of the common fossils found in this region. Detailed illustrations help identify many of the fossilized organisms that can be found today. Among the most interesting illustrations presented in the book are Gijsbert van Frankenhuyzen's conceptions of what the fossilized creatures may have looked like when they were alive. In addition, color illustrations by van Frankenhuyzen depict spectacular scenes of ancient life in the Great Lakes area. The book begins with a brief review of biological and geological principles and then offers a framework for the study of the fossil record. Methods of collection, preservation and maintenance of fossils are also presented. Throughout the book, common fossils found today embedded in rocks and other solid matter are emphasized. J. Alan Holman is Curator of Vertebrate Paleontology in the Michigan State University Museum, and Professor of Geological Sciences, Michigan State University. 11 color drawing insert & 87 figures.